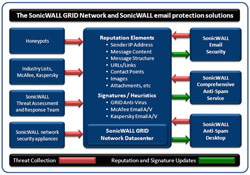 Every five minutes, the dynamic SonicWALL GRID Network automatically updates SonicWALL GRIDprint and IP reputation information for each SonicWALL email protection solution, as well as user and group LDAP entries; spam word-and-phrase content; and SonicWALL GRID Anti-Virus and McAfee anti-virus signatures as required. 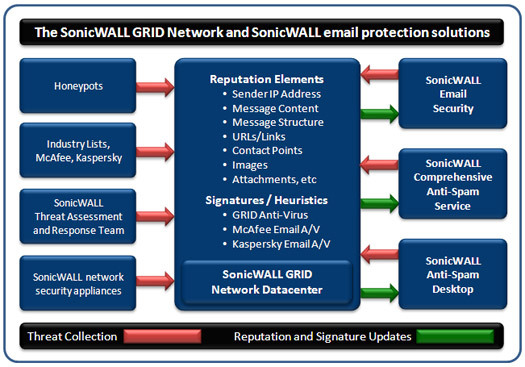 The SonicWALL GRID Network began in 2003. From the beginning, the GRID network worked as a collaborative means of collecting threat information, vetting it and determining a reputation score for that information. Initially, reputation scores were computed for email message content, structure and links. Sender IP reputation as well as reputations for images, attachments and other message elements were added. SonicWALL utilizes threat information from a wide variety of business sources including user contributions, user votes, certified real-time black lists, industry sources, SonicWALL's Threat Response Team, and more. All sources are vetted for accuracy and their relevance to business email. Sources which are consumer oriented such as ISP-based spam votes are not used as they reduce the aggressiveness of the overall system.